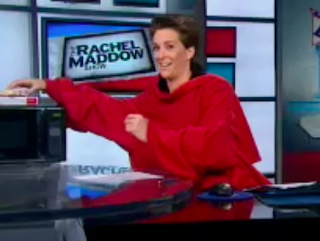 Are you going to wear your Snuggie on the show tonight? Seems like all of us in your audience need to hunker down with some comfort food to help ease the pain of the election loss last night. I remember you wearing your waders on the show once, and your Snuggie made at least one appearance in the past. Of course I can just as easily picture you appearing on the show tonight in mourning black with a black veil draped over a very stylish wide-brimmed black hat, looking like you stepped out of a Dynasty rerun. In any case, we'll be looking to Aunt Rachel for comfort tonight. One point that's been nagging at me a little since the Dubya reelection was the intended role of the Electoral College. In my thinking, the Framers of the Constitution probably created the Electoral College as a buffer to protect the people from themselves when they've been induced to elect a charlatan/scoundrel type to the White House. By having them elect delegates, rather than the President directly, the Founding Fathers offered us a final opportunity for common sense to prevail, with the expectation that the more-educated delegates would cast votes for an appropriate candidate. At the time, in 2004, I thought the Electoral College had failed to perform the function for which it had been designed. Why have an Electoral College if the delegates are bound tightly to the popular vote? What would be the point? And this election seems to be even more in need of the Electoral College protecting the people from themselves. Does this idea relate at all to the thinking of the Founding Fathers, or is this just something that wandered into my head on its own? It just seems kind of odd to me that the College would be set up originally just to echo the popular vote. The people elect delegates rather than the President directly. So? Some civics professor a long time ago may have planted in my head the idea of the people being protected from themselves by the Electoral College, but I don't remember. Just thought I'd ask.